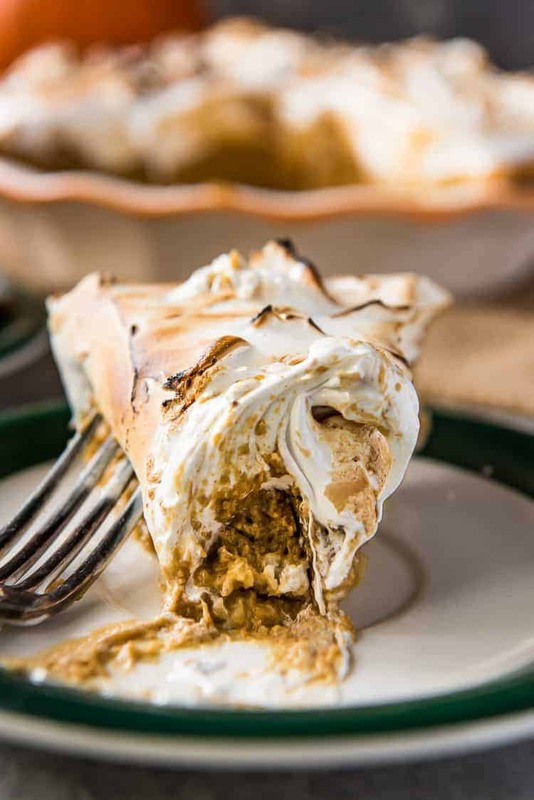 This creamy, richly spiced Pumpkin Pie with Toasted Meringue is a deliciously upgraded version of the fall standard. Homemade pumpkin custard is topped with a simple meringue, then toasted for that comforting marshmallow flavor. Try it with a chocolate crust for an elevated s’mores feel! I honestly can’t believe it’s taken me this long to share an actual pumpkin pie. This little blog has been around since 2014, and finally – 4 years later – I present you this bonafide, unadulterated pumpkin pie recipe. Well, OK, so maybe it’s slightly adulterated. 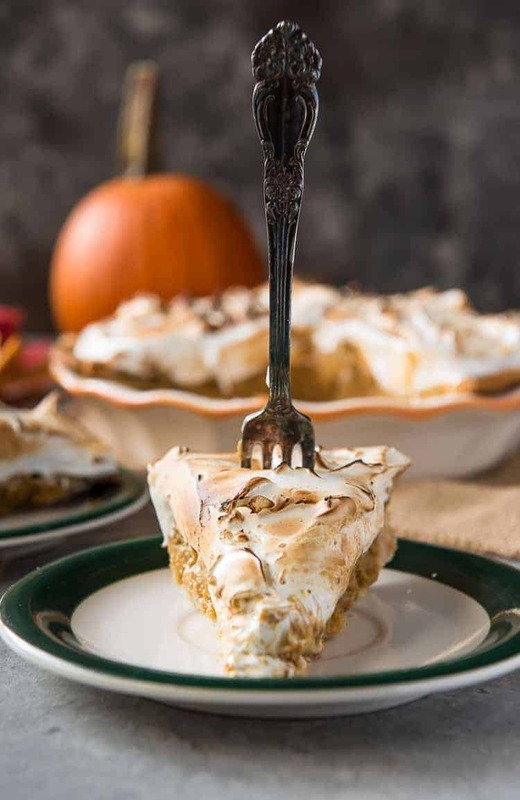 This may not be the most photogenic pie, but the toasted meringue topping is the best kind of addition you could possibly imagine! JUST TAKE ME TO THE PUMPKIN PIE ALREADY! 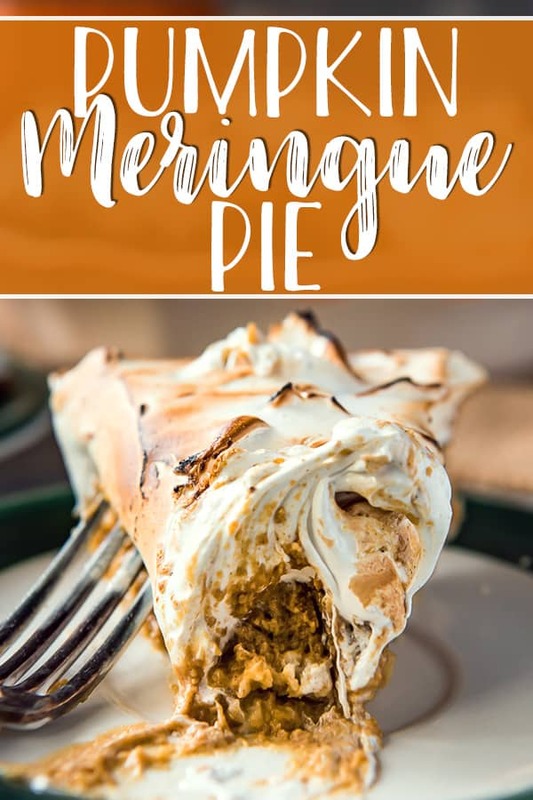 If you’d rather skip my (pretty darn helpful) tips and tricks, essential cooking info, and similar recipe ideas – and get straight to this deliciously easy Pumpkin Pie recipe, just scroll right on down to the bottom of the page where you can find the printable recipe card! Believe it or not, I actually didn’t care for pumpkin pie until about 5 years ago. I guess that’s just something that happens when you’re brought up without a thing that everyone else is gaga over. My Nana wasn’t a pumpkin pie lover, so we never had them on our holiday table. Even after she passed away, I wasn’t terribly eager to try pumpkin pie – despite working in a grocery store bakery for years. Not even a homemade one. I wish I could recall exactly what triggered my love of pumpkin pie, since it was the gateway to my obsession with all thing pumpkin spice. What’s Pumpkin Pie Spice Made Of? Pumpkin pie spice, also referred to simply as pumpkin spice, is known as ‘mixed spice’ in England. Also used as a cooking seasoning, it is a blend of ground cinnamon, nutmeg, ginger, cloves, and sometimes allspice. I like to add cardamom to my homemade pumpkin pie spice, just for a little additional warmth. Pumpkin pie is one of the simplest pies you can make, as well as the most satisfying for fall lovers! First, place a round of pie dough in a 9-inch pie plate. Sprinkle it evenly with a bit of flour, then blind bake it in a 425 degree oven for about 15 minutes. While the crust bakes, combine filling ingredients in a large bowl and whisk together until well blended. Remove the partially baked crust from the oven and pour in the blended pumpkin pie filling. Bake for 15 minutes at 425 degrees. Cover the outer crust with aluminum foil or a pie shield, then drop the temperature to 350 degrees and bake for 45-55 minutes. The pie is done when the center still slightly jiggles but is no longer wet. Cool the pie on a cooling rack to fully set before refrigerating. 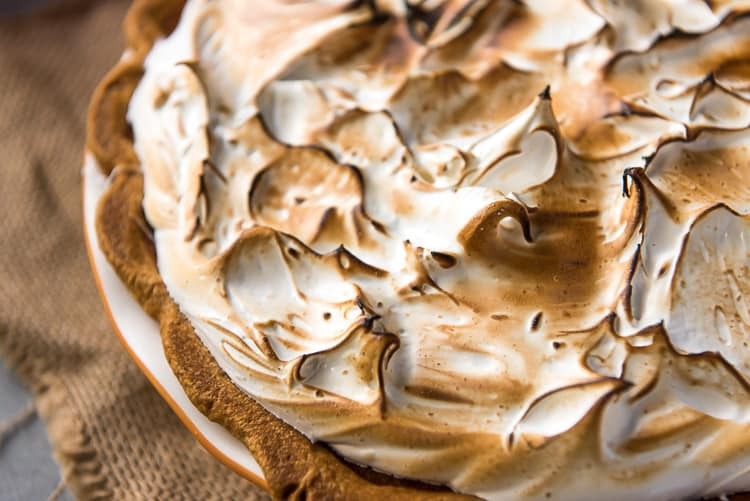 When ready to serve, top with meringue and toast in the oven for 8-10 minutes, or use a small kitchen torch to brown. Can Pumpkin Pie Be Left Unrefrigerated? Not for more than 2 hours. After the pie is baked, cool it completely on a wire rack, then transfer it to the refrigerator to chill. After topping with meringue, return it to the refrigerator before serving. Can Pumpkin Pie Be Frozen? Yes! 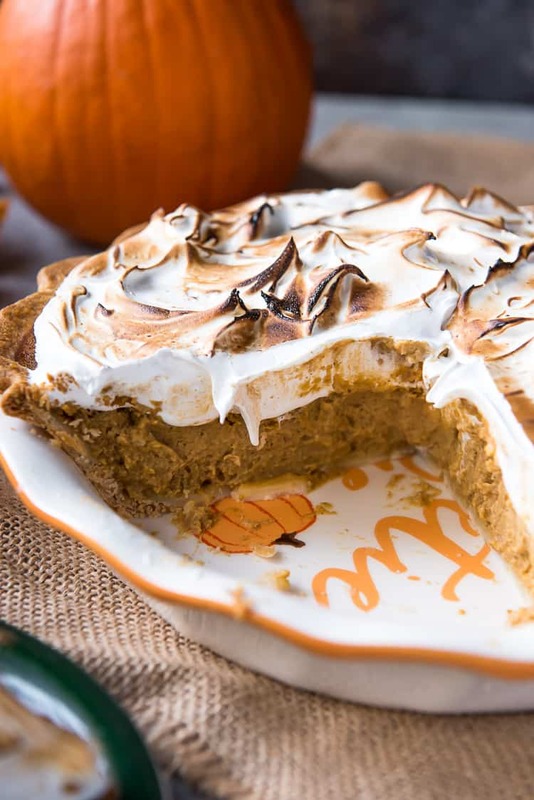 Pumpkin pie can be frozen for up to a month after it’s baked, but without the meringue topping. After baking and cooling completely, wrap the pie tightly in several layers of plastic wrap. Place a final layer of aluminum foil over the plastic, or place it in a zipper bag to avoid freezer burn. When you’re ready to serve the frozen pumpkin pie, transfer it to the refrigerator at least 12 hours before eating. This allows the pie to thaw evenly and avoids weepy filling and soggy crust. 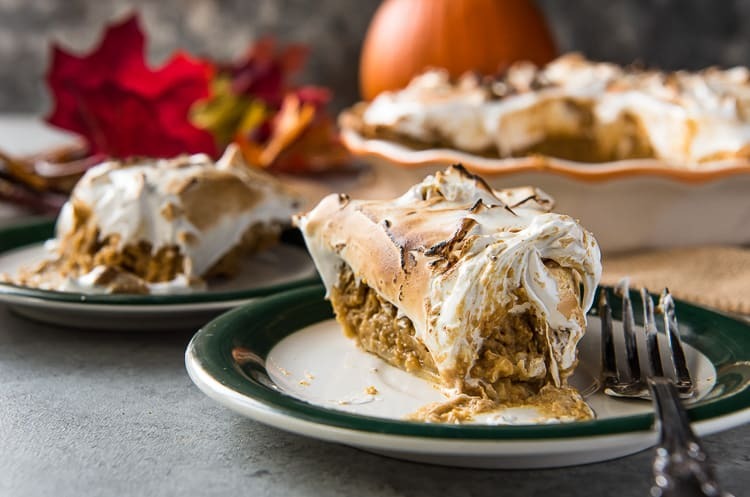 LOOKING FOR MORE FALL PIE RECIPES? 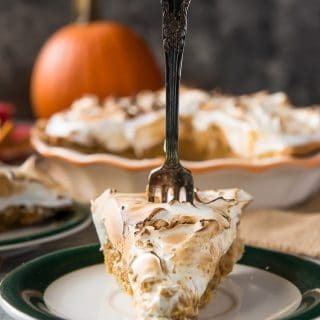 This creamy, richly spiced Pumpkin Pie with Toasted Meringue is a deliciously upgraded version of the fall standard. Homemade pumpkin custard is topped with a simple meringue, then toasted for that comforting marshmallow flavor. Try it with a chocolate crust for an elevated s'mores feel! Heat the oven to 425 degrees F. Roll out pie crust and transfer it to pie dish. Trim the edges and crimp. Sprinkle the crust with a bit of flour and either prick with a fork or place a round of parchment inside and fill with baking weights. Par-bake the crust for 12-15 minutes. Allow to cool slightly, then remove the weights. While crust is baking, place the eggs in a large bowl. Beat well, then whisk in the sugars, spices, and orange zest. Add the pumpkin puree and heavy cream and whisk until fully combined. Pour the pie filling into the par-baked crust. Bake for 15 minutes, then carefully cover the outer crust with aluminum foil or a pie shield. 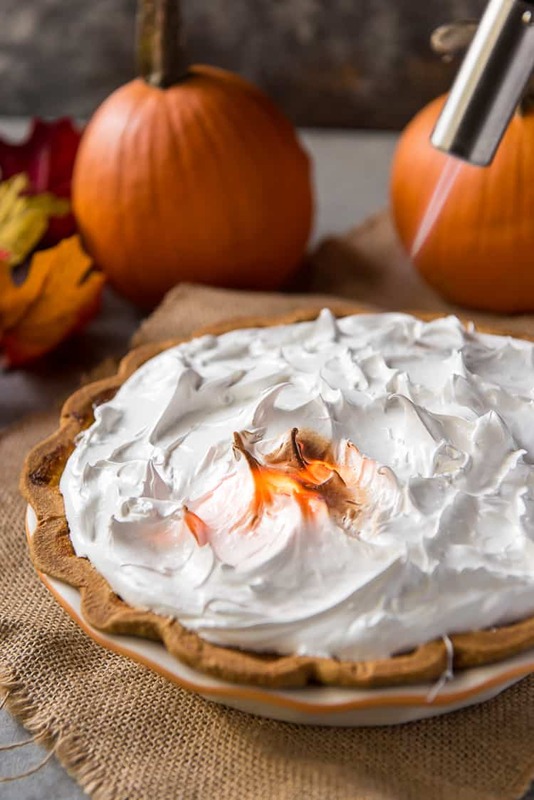 Reduce the oven temperature to 350 degrees F and continue baking for 45-55 minutes, until the middle of the pie is slightly jiggly, but no longer wet to the touch. Remove pie from oven and cool on a wire rack to room temperature to set. Refrigerate to chill to 40 degrees or lower. Bring a small saucepan to a low boil over medium heat. In the bowl of a stand mixer (or in a metal bowl), combine the egg whites, sugar, and cream of tartar. Place the bowl over the saucepan. Continuously whisk the mixture over the boiling water until the sugar is dissolved and the mixture is warm, 3-4 minutes. Remove bowl to the stand mixer fitted with the whisk attachment (or use a hand mixer.) Whip the meringue on low for 2 minutes, then gradually increase the speed to high and mix for 5-6 minutes, or until thick, stiff peaks form. Add the vanilla and mix for 1 more minute. 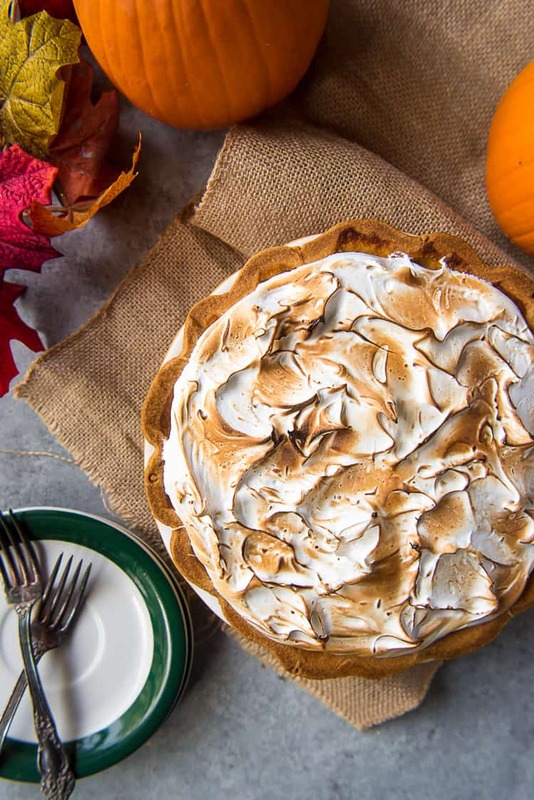 Top the chilled pie with the meringue. Return to the refrigerator until ready to serve, then brown the meringue in a 350 degree oven for 8-10 minutes, or use a kitchen torch to brown it instead. PIN THIS PUMPKIN PIE RECIPE FOR LATER!